Black Sign Holder includes two 22 in. wide x 28 in. high white write on/wipe off signs for double exposure. 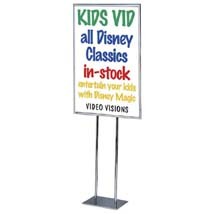 This Message Sign is easy to use, mobile and easily changeable with mess free dry erase markers. Dry erase markers are sold separately, search item 4496.